In mid-November 1792 the twenty-one-year-old Beethoven arrived in Vienna from Bonn. He had arranged to study with Haydn, and began to do so at once, as his noted payments to the older composer reveal. These official lessons continued until Haydn left for England in January 1794, but it seems that help with Beethoven’s new compositions never formed a part of the tuition, since the preserved fruits of the study consist only of improvements made, under critical supervision, to a number of the younger composer’s earlier (Bonn) compositions. Later study by Beethoven with Albrechtsberger, and just possibly with Salieri, apparently did not touch on chamber music. 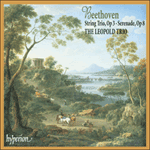 Beethoven’s important early works for string trio seem to have been composed fairly independently of his teachers, and were probably written as vehicles for self-instruction in what was then considered to be a ‘difficult’ musical medium. The Trio in E flat major, Op 3, was composed in mid or late 1795. It opens with a bold, almost orchestral effect, combining syncopation with repeated chords in a brusque first subject. The whole work is notable for its clever variety of rhythms and textures, and its defined character is remarkable even if we compare it with the more assertive aspects of the Opus 1 Piano Trios, the Opus 2 Piano Sonatas, or other known early Vienna products. It has been suggested that the six-movement structure of Op 3 was directly modelled on Mozart’s recently published (by Artaria in 1792) Divertimento in E flat major for string trio, K563, in which, also, two different Menuetto and Trio alternative pairs are heard on either side of a slow fourth movement, but if Beethoven was indeed affected by the earlier masterpiece, it seems rather that he was reacting to, or even against, Mozart in this work. Not until the Serenade in D major, Op 8, was Beethoven to choose a more divertimento-like style and address. The Allegro con brio (considered to be a fast speed at that time), with both its fiery opening material and much of the lighter material, would have been tricky for standard string players—especially in the key of E flat, not then regarded as ideal for strings. The premature ‘false recapitulation’ in F minor anticipates the proper one by nearly forty bars, extending the development section to about twice its predictable length, but the forward pointing of the thematic restlessness compensates for these rather unorthodox proportions. Beethoven was still composing his Opus 1 (three piano trios) around 1795, and at some early stage he started to adapt the first movement of this work for that medium; the authority of his copying hand is clear, even though suggestions for keyboard figures seem to be much more sketchy. The Andante—in more standard sonata form—is built intriguingly around gentle anacruses and figures in which rests seem almost as important as sounded notes. Although the development is more in the manner of a sonatina movement than one from a sonata, a delightful touch appears soon after the recapitulation where the extension of the opening by the viola is no longer doubled at the octave by the violinist, as formerly, but is instead accompanied by expressive descanting figures. A few bars later in the recapitulation the rhythms are cunningly disguised to create an illusion that the players have drifted out of syncopation, but Beethoven is simply developing rhythmic patterns to their own benefit. A notable device just before each double bar is the stressed off-beat ostinato in the viola part. The special features of this movement were all to continue as Beethoven trademarks for many years; this Andante in B flat seems particularly to anticipate the Eighth Symphony, composed in 1812. The two Menuetti, each to be heard alternativement with its Trio (the second Trio actually being headed simply ‘minore’), demand different tempos (the standard Allegretto and the faster Moderato, respectively). In each case the rather more pointed and even slightly military character of the Menuetto is offset by the lighter Trio—indeed the ‘minore’ seems eventually to evaporate in solo-violin heights of ecstasy; the far from impractical Beethoven sees to it that his soloist has time to descend from the high position before having to start either the repeat or the reprise of the Menuetto: Moderato. The warmly expressive Adagio in A flat is fluidly expressive, with the instruments exchanging the coloratura lines in a remarkably mature manner. The A flat Adagio of the later Piano Sonata Op 10 No 1 inhabits a similarly expansive world to even more striking harmonic effect. The Finale: Allegro of Opus 3 probably owes some debt to Beethoven’s contrapuntal studies with Albrechtsberger, who seems to have stood in semi-officially for Haydn during the latter’s absences abroad during the mid-1790s. In any event it is a witty contrapuntal movement, of the emphatic type that remained a Beethoven speciality long after he had ceased to compose string trios—the motto-adorned last quartet movement (Op 135, movement 4) has something of the same manner, and there are examples also in the last piano sonatas. Here, as later, the composer is apparently not at all worried when, at times, strict counterpoint has to make way for even more emphasis, such as from bar 199 where each of the participating solo lines enters in turn with the same triplet subject; it looks like fugue, but actually it is but the same declamation, amplified threefold by repetitions at the octave. That is yet another Beethoven trademark, already displayed at the age of twenty-four. En 1792, Beethoven, alors âgé de vingt et un ans, quitta Bonn pour Vienne, où il arriva à la mi-novembre. Là, s’étant arrangé pour étudier avec Haydn, il commença ses cours sur-le-champ, comme le révèlent ses règlements au compositeur aîné. Ces leçons officielles se poursuivirent jusqu’au départ de Haydn pour l’Angleterre, en janvier 1794, mais cet enseignement n’entendit apparemment jamais aider Beethoven dans ses nouvelles compositions, les seuls fruits dont nous disposons étant des améliorations apportées, sous une direction critique, à un certain nombre des œuvres antérieures (Bonn) du jeune compositeur. Quant aux études ultérieures de Beethoven auprès d’Albrechtsberger, et peut-être de Salieri, elles ne portèrent manifestement pas sur la musique de chambre. Beethoven semble avoir composé ses premières œuvres importantes pour trio à cordes assez indépendamment de ses maîtres—probablement pour s’auto-instruire dans ce qui était alors considéré comme un moyen d’expression musical «difficile». Le Trio en mi bémol majeur, op.3, écrit au milieu ou à la fin de 1795, s’ouvre sur un effet hardi, quasi orchestral, qui combine syncope et accords répétés en un brusque premier sujet. L’ensemble de cette œuvre vaut pour son ingénieuse diversité de rythmes et de textures, tout en possédant un caractère défini remarquable, même comparé aux aspects plus assurés des Trios avec piano, op.1, des Sonates pour piano, op.2, ou d’autres célèbres œuvres viennoises de jeunesse. D’aucuns ont suggéré que la structure à six mouvements de l’op.3 s’inspirait directement du Divertimento en mi bémol majeur pour trio à cordes, K563 de Mozart (alors publié depuis peu par Artaria, en 1792), où deux paires différentes de Menuetto et Trio flanquent un quatrième mouvement lent; mais si Beethoven fut effectivement affecté par ce chef-d’œuvre antérieur, il semble plutôt avoir réagi, dans cette œuvre, à, et même contre, Mozart. Il fallut attendre la Sérénade en ré majeur, op.8 pour que Beethoven choisît un style et un abord davantage apparentés au divertimento. Le matériau initial fougueux et une grande partie du matériau plus léger de l’Allegro con brio (un tempo jugé rapide à l’époque) auraient été épineux pour des joueurs d’instruments à cordes ordinaires—surtout dans la tonalité de mi bémol, non considérée alors comme idéale pour les cordes. La «fausse reprise» prématurée, en fa mineur, anticipe la reprise de presque quarante mesures, étendant la section de développement au double environ de sa longueur prévisible, mais la précocité de l’agitation thématique compense ces proportions assez peu orthodoxes. Beethoven était encore au début de son op.1 (trois trios avec piano), vers 1795, lorsqu’il commença à en adapter le premier mouvement pour trio à cordes; la copie est assurément de sa main, même si des suggestions de figures pour clavier semblent beaucoup plus esquissées. L’Andante—sis dans une forme sonate plus standard—est curieusement bâti autour de douces anacrouses et de figures où les pauses paraissent presque aussi importantes que les notes jouées. Quoique le développement soit plus à la manière d’un mouvement de sonatine que de sonate, une touche délicieuse survient peu après la reprise, où le prolongement de l’ouverture par l’alto n’est plus doublé à l’octave par le violoniste, comme auparavant, mais accompagné d’expressives figures en déchant. Quelques mesures plus tard, dans la reprise, les rythmes sont habilement travestis pour créer l’illusion que les instrumentistes sont entraînés hors de la syncope, mais Beethoven développe simplement les schémas rythmiques pour eux-mêmes. Un procédé vaut d’être particulièrement noté, juste avant chaque double barre: l’ostinato anacroustique accentué dans la partie d’alto. Les caractéristiques de ce mouvement devaient demeurer les sceaux de Beethoven durant maintes années; cet Andante en si bémol semble remarquablement anticiper la Huitième symphonie, composée en 1812. Les deux Menuetti, entendus chacun alternativement avec son Trio (le second Trio est, en réalité, simplement intitulé «minore»), exigent différents tempos (respectivement l’Allegretto ordinaire et le Moderato plus rapide). À chaque fois, le caractère plus insistant, voire légèrement militaire, du Menuetto est contrebalancé par le Trio plus léger—le «minore» semble finalement s’évanouir en des paroxysmes d’extase pour le violon solo; loin de manquer d’esprit pratique, Beethoven fait en sorte que son soliste ait le temps de descendre de sa position élevée avant de devoir entamer soit la répétition, soit la reprise sur le Menuetto: Moderato. L’Adagio en la bémol, ardent, recèle une fluidité expressive, les instruments échangeant les lignes de coloratura d’une manière des plus abouties. L’Adagio en la bémol de la Sonate pour piano op.10 no1, ultérieure, habite un univers tout aussi expansif, pour un effet harmonique plus saisissant encore. Le Finale: Allegro de l’op.3 doit probablement un peu aux études contrapuntiques de Beethoven auprès d’Albrechtsberger, lequel semble avoir remplacé, de façon semi-officielle, Haydn durant ses séjours à l’étranger, dans les années 1795. Quoi qu’il en soit, il s’agit d’un mouvement contrapuntique plein d’esprit, de ce type emphatique qui demeurera une spécialité beethovénienne bien après que le compositeur eut cessé d’écrire des trios à cordes—le mouvement 4, orné du motif conducteur, du dernier quatuor à cordes (op.135) procède un peu à l’identique, et l’on trouve également des exemples équivalents dans les dernières sonates pour piano. Ici, comme plus tard, le compositeur n’est manifestement pas du tout inquiet quand, parfois, le contrepoint strict doit parvenir à plus d’emphase encore, comme à partir de la mesure 199, où chaque ligne soliste participante entre tour à tour avec le même sujet en triolet; et ce qui ressemble à une fugue n’est, en réalité, que la même déclamation, amplifiée triplement par des répétitions à l’octave—autre sceau dont le compositeur faisait déjà montre à vingt-quatre ans. Mitte November 1792 kam der 21jährige Beethoven aus Bonn nach Wien. Er hatte ein Studium mit Haydn arrangiert, womit er gemäß seinen Zahlungseintragungen an den älteren Komponisten sofort begann. Dieser offizielle Unterricht dauerte solange an, bis Haydn im Januar 1794 nach England ging. Es scheint jedoch, daß dieser Unterricht keinerlei Hilfe bei den neuen Kompositionen Beethovens beinhaltete, da die Früchte des Studiums lediglich unter der kritischen Aufsicht Haydns gemachte Verbesserungen zu einigen der früheren (Bonner) Werke des jüngeren Komponisten waren. Das spätere Studium Beethovens bei Albrechtsberger, und möglicherweise auch bei Salieri, umfaßte offenbar nicht die Kammermusik. Beethovens bedeutende frühe Werke für Streichtrio scheinen ziemlich unabhängig von seinen Lehrern komponiert worden zu sein, und wurden womöglich als Mittel der Selbstanleitung geschrieben, einem zur damaligen Zeit als „schwierig“ geltenden musikalischen Medium. Das Trio in Es-Dur, op. 3, wurde Mitte oder Ende 1795 komponiert. Es beginnt mit einem kühnen, nahezu orchestralen Effekt und verbindet in einer brüsken ersten Passage Synkopen mit Akkordwiederholungen. Das gesamte Werk ist bemerkenswert bzw. seine clever gewählte Vielfalt an Rhythmen und Textur sowie sein wohl definierter Charakter sind beeindruckend, selbst wenn man es mit den eher nachdrücklichen Aspekten des Klaviertrios op. 1, den Klaviersonaten op. 2 oder anderen bekannten frühen Wiener Werken vergleicht. Es wurde vermutet, daß sich die Sechs-Satz-Struktur des op. 3 direkt an dem kurz zuvor (1792 durch Artaria) veröffentlichten Divertimento in Es-Dur für Streichtrio, K563, von Mozart orientiert, in welchem jeweils im vierten Satz auch zwei verschiedene alternative Paare von Menuetts und Trios zu hören sind. Sollte Beethoven wirklich von dem frühen Meisterwerk beeinflußt worden sein, dann hat es jedoch vielmehr den Anschein, daß er in diesem Werk auf oder sogar gegen Mozart reagiert. Erst bei der Serenade in D-Dur, op. 8, wählte Beethoven einen dem Divertimento ähnlicheren Stil und Ansatz. Das Allegro con brio (damals als schnell empfunden) wäre sowohl mit seiner feurigen Eröffnung als auch den meisten leichteren Passagen für Standard-Streicher schwer zu spielen gewesen—vor allem in Es-Dur, einer zur damaligen Zeit als für Streicher nicht ideal angesehenen Tonart. Die vorzeitige „falsche Reprise“ in f-Moll geht der richtigen um etwa vierzig Takte voraus, wodurch der Durchführungsteil auf seine nahezu doppelte Länge ausgedehnt wird, aber die vorandrängende thematische Rastlosigkeit wiegt diese eher unorthodoxen Proportionen wieder auf. Um 1795 komponierte Beethoven noch immer sein Opus 1 (drei Klaviertrios) und begann zu einem frühen Zeitpunkt, den ersten Satz seines Werkes für dieses Medium zu adaptieren; die Autorität seiner Adaptionen ist eindeutig. Vorschläge für Klaviermotive scheinen jedoch viel bruchstückhafter. Das Andante—in gewöhnlicherer Sonatenform—ist auf faszinierende Weise um leichte Auftakte und Motive aufgebaut, in denen Pausen nahezu so wichtig wie gespielte Noten scheinen. Obwohl die Durchführung mehr der einer Sonatine als einer Sonate gleicht, folgt bald nach der Wiederholung eine reizende Spielart, wo die Ausdehnung der Einleitung durch die Bratsche nicht mehr von dem Bratschenspieler wie vormals bei der Oktave doppelt gespielt wird, sondern statt dessen durch ausdrucksvolle Diskanten begleitet wird. Ein paar Takte weiter in der Wiederholung sind die Rhythmen raffiniert verändert, wodurch die Illusion entsteht, die Spieler seien aus der Synkopierung herausgeglitten. Beethoven läßt jedoch lediglich rhythmische Muster als Selbstzweck entstehen. Ein besonders erwähnenswertes Stilmittel kurz vor jedem Doppeltakt ist das im Bratschenpart betont gespielte Ostinato im Gegentakt. Die speziellen Merkmale dieses Satzes sollten über viele Jahre hinweg als typisch für Beethoven gelten; dieses Andante in B-Dur scheint ganz besonders die 1812 komponierte Achte Sinfonie anzukündigen. Die zwei Menuetti, jedes alternativement mit seinem Trio zu hören (das zweite Trio ist einfach mit „minore“ überschrieben), schreiben unterschiedliche Tempi vor (das gewöhnliche Allegretto bzw. das schnellere Moderato). In beiden Fällen wird der eher etwas unverblühmte, ja sogar leicht militärische Charakter des Menuetts durch das leichtere Trio wettgemacht—das „minore“ scheint sich letztendlich sogar in hohen ekstatischen Soloviolinenparts zu verflüchtigen; der alles andere als unpraktische Beethoven ist darum bedacht, daß der Soloist genug Zeit hat, um von der hohen in die normale Position zu gelangen, bevor er entweder die Wiederholung oder die Reprise des Menuettos (Moderato) zu spielen beginnt. Das bewegt kraftvolle Adagio in As-Dur ist fließend und ausdrucksstark, wobei die Instrumente die Koloratur auf beachtlich beherrschte Weise wechseln. Das Adagio in As-Dur der späteren Klaviersonate op. 10, Nr. 1, ist ähnlich ausschweifend mit noch eindrucksvolleren harmonischen Effekten. Das Finale: Allegro des Opus 3 ist möglicherweise mit das Ergebnis von Beethovens Kontrapunktstudium bei Albrechtsberger, der Haydn halboffiziell während seiner Auslandsaufenthalte Mitte der 1790er Jahre vertreten zu haben schien. Es handelt sich hier auf jeden Fall um einen spritzigen kontrapunktischen Satz der emphatischen Art, was eine Spezialität Beethovens bis lange nach Beendigung seiner Komposition von Streichtrios blieb—der mit Motiven ausgeschmückte letzte Quartettsatz (op. 135, Satz 4) hat einen ähnlichen Stil, und auch in den letzten Klaviersonaten gibt es Beispiele hierfür. Hier, ebenso wie später, scheint es den Komponist nicht im geringsten zu stören, wenn ein zeitweise strikter Kontrapunkt einer noch stärkeren Betonung weichen muß, wie z. B. ab Takt 199, wo jede Solobewegung der Reihe nach mit demselben Triolenthema einsetzt; es sieht einer Fuge ähnlich, ist aber in Wirklichkeit dieselbe, durch dreifache Wiederholung bei der Oktave verstärkte Deklamation; eine weitere Spezialität des damals erst 24jährigen Beethovens.